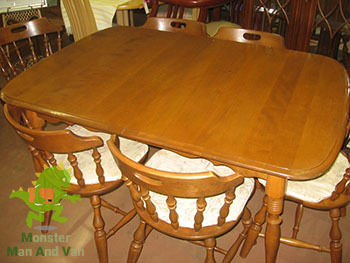 Monster Man and Van London is the company to get in touch with when there is a furniture collection job on your books that needs to be handled with the utmost care and respect for the detail. Our trained and very reliable professional movers are ready to take care of the task you entrust them with utmost professionalism, care and respect. Our furniture collection in London service covers the territory of the capital completely. There are few other man and van moving companies out there that provide full London coverage in a manner as efficient as ours. No matter whether you have just purchased a new set of furniture for the living room and you need a moving company to collect it from the store and deliver it to your home, or you just want to send your sister in law the old wardrobe, we are here for you. As a respectable man and van London based company, we maintain a fleet of modern removal vans that are just perfect for furniture collection in London. All our vehicles come with the relevant loading and safety gear, e.g. moving blankets (cleaned after every relocation job), trolleys, belts and ropes to secure your goods while on the road. Driven by skillful drivers and supplied with state of the art GPS navigation systems, our vans are a guarantee that your furniture delivery is going to be completed in a timely fashion. Actually, when you call us, you are guaranteed to have a team of licensed movers along with a suitable vehicle arrive at the location from which the furniture is to be collected within the shortest time frame. It usually does not take us more than a couple of hours to complete a furniture delivery in London after we have been contacted. Then again, you can opt to having our technicians give you a helping hand with the unpacking and assembly of the furniture if that is necessary. This will prolong the period within which the service would be completed, but once we are done, you can go on to enjoying the results right away. Feel free to contact us at any time for any sort of furniture relocation and collection in London. Our customer support operators are available 24/7 both over the phone and via email. London is a huge city with many nice residential quarters. Typically North London is cited as the better part of the capital to live in. This is because most of the historical districts are here. The south was the countryside well until the arrival of the railway in the middle of the 19th century. Most of the Tube stations in London are also to the north of the River Thames.